Extra Mile Challenge 2015 competitors. 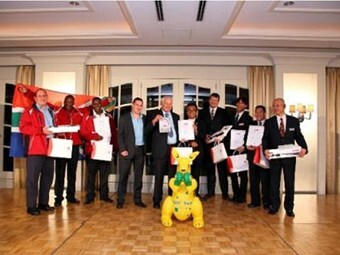 The UD Trucks’ Extra Mile Challenge 2015 crown is heading down under, after the Australian team pipped competitors from South Africa and Japan in the final. Held in Ageo, Japan, at the new UD Experience Centre and adjacent test course, competitors were challenged to extend their UD trucks efficiency by improving fuel consumption and uptime, while demonstrating driver skill. Based on a transport delivery cycle, the teams were tasked with three sections to complete, a pre-drive inspection, a driving skill test, and a pick-up and delivery test, each of which was judged on revenue, fuel efficiency, uptime and maintenance costs, and safe driving. South Africa was graded the most fuel efficient by the judging panel, while Japan took out the best driving skill award and Australia completed the best pre-drive inspection. Australia also completed the task with the highest profit, making them the winners this year. UD Trucks vice president of brand and product line Kishi Nobuhiko says the event is designed to demonstrate that drivers and businesses are capable of improved safety and efficiencies. "The Extra Mile Challenge is an event predicated on improving the work ‘gemba’ for customers," Nobuhiko says. "We hope our customers can take the next big step for their business and we ask them to look forward to UD Trucks’ activities moving forward."